It was almost inevitable that a follow-up release to 1990's watershed Hammerheart album, dealing with very much the same subject (historical themes and pagan beliefs of the Viking peoples), was fated to prove somewhat disappointing; and despite a valiant effort on the part of Bathory mastermind Seth Quorthon, 1991's Twilight of the Gods has often unfairly languished in the shadows of its noteworthy predecessor. For the record, its tracks were even more epic in length and scope, its subject matter even more tragic and depressing, but perhaps the oppressive weight of it all was simply more than most could bear. Still, when removed from this chronological experiment, there's no denying that Twilight of the Gods is one heck of a heavy metal album. Maybe it could have used a little more of the old-school black metal simplicity of early Bathory, but the band's forward momentum was such at this juncture in their career that a look back, however brief, was simply not in the cards. Starting off with the 14-minute glory of the title opus, the album almost always maintains a steady head of steam with the high-caliber songwriting heard on the likes of "Blood and Iron" and "Under the Runes," with its specially beautiful and memorable acoustic guitar intro. The superb "Through Blood by Thunder" is introduced by yet another elegant guitar melody and a dramatic spoken-word section, but the plodding tandem of "To Enter Your Mountain" and "Bond of Blood" is where distraction inevitably sets in. Finally, the previous album's namesake tune, "Hammerheart," bring listeners to the finish line with a virtually all-vocal performance, and though Quorthon's dubious singing ability continues to raise eyebrows on occasion, this is usually compensated by the wondrous music itself. Also deserving of praise are his virtuously performed guitar leads, whose contributions can at times be overlooked in the melee of grandiose arrangements all around. 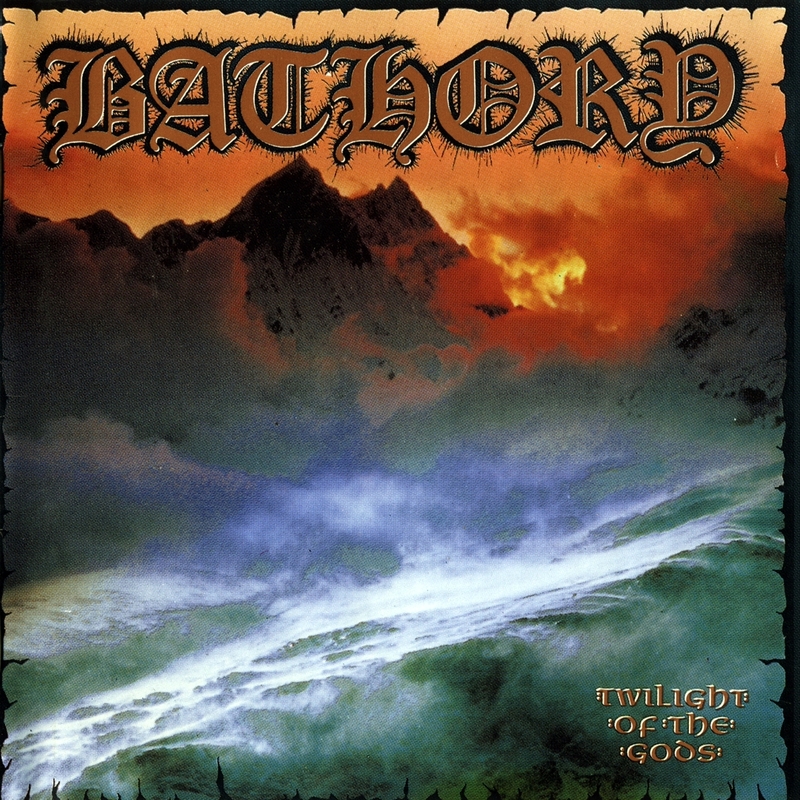 Once again a stellar outing for Bathory, Twilight of the Gods would close yet another chapter in the group's varied history, as Quorthon decided to pause and reflect on his past achievements with a series of retrospective collections, after which Bathory veered toward new horizons once again.